This one-pan chicken dish feels special enough to serve at a dinner party, but is easy enough to make on a busy weeknight. Chicken thighs are pan-fried over high heat for extra-crispy skin, then roasted with plenty of garlic. Don't be put off by the amount of garlic in the recipe! Slow-roasting caramelizes and sweetens the cloves until they're soft and golden. 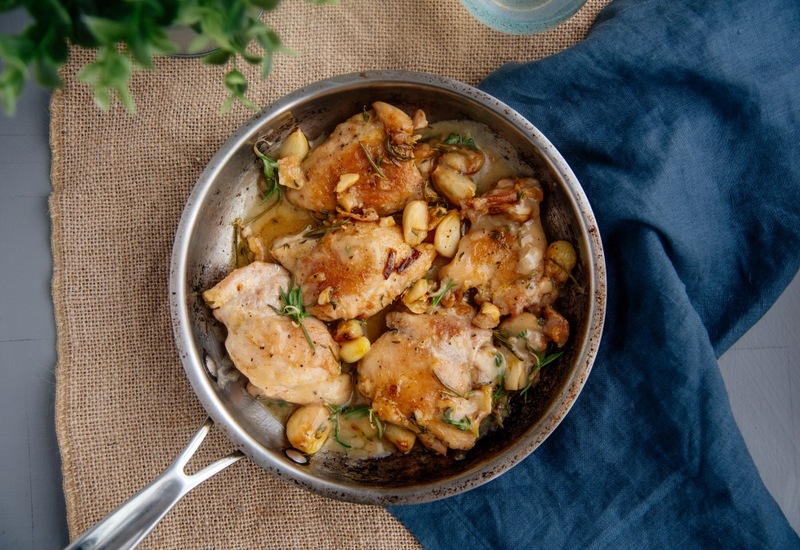 The chicken is then finished with a savory, fragrant pan sauce filled with fresh herbs. Serve this dish with creamy mashed potatoes, and plenty of crusty bread for soaking up that delicious gravy. If you love gravy, double the liquid in this recipe for extra sauce to pour over your side dishes. For super moist and flavorful chicken, brine the thighs ahead of time. Place the chicken thighs in a large resealable bag, add 1 cup buttermilk, 1 teaspoon kosher salt, and 1/2 teaspoon ground pepper. Stir to coat, seal bag and refrigerate for 1 hour or up to 1 day. Per Serving: 246 calories; 12g fat; 4.6g carbohydrates; 28g protein; 137mg cholesterol; 324mg sodium. You can never have too much garlic, right? Try adding 20 cloves to a dish. Well that's what this calls for and I'm not mad at it. Yeah, this is super garlicy, but I'm not complaining at all. Used bone in chicken breast to make this dish and it was everything and more. Made this for a date and he was happy with it- even with all of the garlic included. This recipe gave me a good excuse to buy a pre-peeled tub of garlic cloves at my local grocery, because I was a little daunted about the 20 cloves! Have no fear, garlic lovers; this is the recipe for you. Simple, quick, and delicious! This was a very simple recipe! The rosemary and thyme gave the gravy a distinct flavor that was very delicious. The chicken was so tender and juicy, plus the right amount of flavor for garlic lovers like myself.